You'll laugh your head off. "Being dead has never been cooler. Go Nathan Abercrombie! You're a zombie for the 21st century." Gordon Korman, author of 39 Clues: One False Note, No More Dead Dogs, Son of the Mob, and tons of other brilliant books. 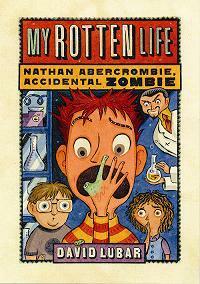 "My Rotten Life stinks—but that's only when Nathan Abercrombie belches. The rest of the book is a delightful and disgusting story about friendship that will leave you in stitches." Lisa Yee, author of Millicent Min, Girl Genius, Absolutely Maybe, and a growing body of delightful fiction. "If you like half dead zombie comedies, this is the book for you." Dan Gutman, author of Babe and Me, The Homework Machine, and roughly eight million other astounding books.